It’s generally assumed that when you reach retirement age, life starts to slow down. But not for mechanics David Anderson and Mathew Hine who spent six months upgrading a 10 MPH mobility scooter into a record breaking dragster that officially hit a top speed of 107.6 MPH. Both David and Mathew hail from the Isle of Man—a place renowned for speed—so it’s no surprise they undertook this challenge. How do you make mobility scooter that still looks like mobility scooter burn rubber. 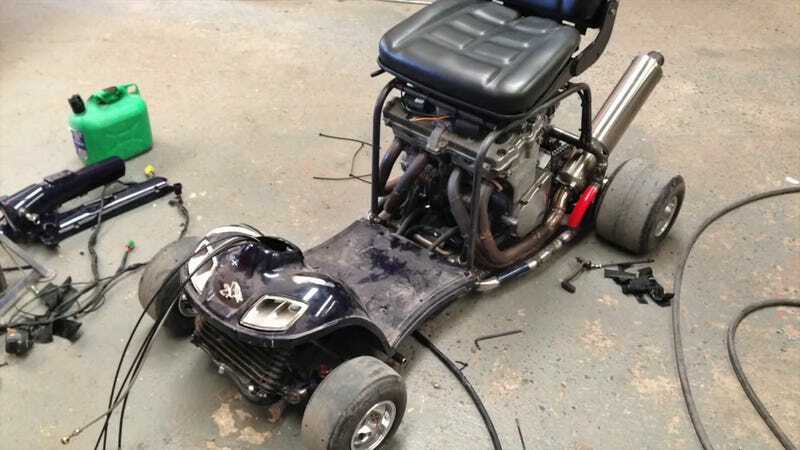 To build their beast, the team merged the scooter with the best parts of a go-kart, including racing slicks and a Suzuki engine. The result is an official Guinness World Record for their Frankenstein-like creation. So if you know your way around a garage, there’s no reason retirement or old age has to be boring. And you’ll never have to worry about ever being late to bingo again.